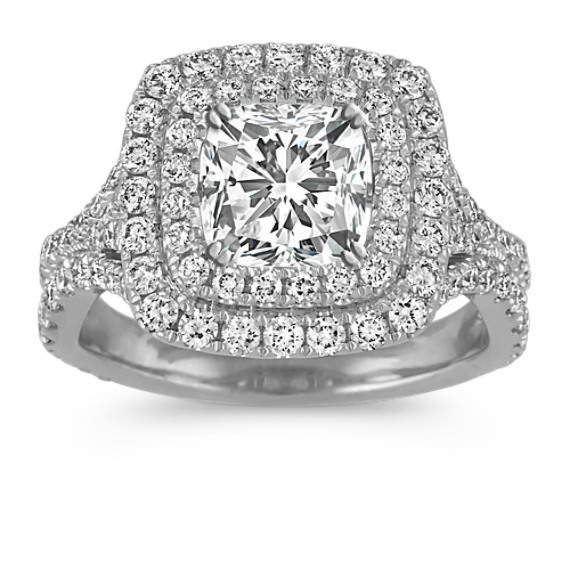 Double Halo Diamond Engagement Ring in 14k White Gold | Shane Co. This double halo engagement ring combines intricate side engraving and milgrain detailing to create this beautiful ring design. One-hundred and sixteen round diamonds, at approximately 1.15 carats total weight, are set in quality 14 karat white gold to create this lovely ring. Simply add the gemstone of your choice at approximately 1.25 carats to complete the look. The ring is 13.5mm wide at the center and 2.5mm at the band.